US vs. UK: Where Students Spend More on Education & Living? College education is extremely expensive everywhere, but UK and US students probably spend the most on their college education. Despite the fact that both UK and US students spend huge amounts of money during their college years and have to pay off insane student loans, it is still a big question who spends more. The Typical Student team has made an attempt to compare the average tuition and fees, food, transportation, and entertainment expenses of both US and UK students and see who the biggest spender is. Also, take a look at the list of 15 BEST Student Cities in Europe with Cheap Accommodation & Tuition Cost. So let’s start with the British students. In general, the biggest UK spenders are the students of the London-based universities such as King's College London, Goldsmiths, Westminster, and UCL. However, students from Glasgow and Edinburgh spend quite big amounts of money as well. So what do all the UK students spend their money on? First of all, UK students spend quite a lot on books and equipment they need for studying. According to savethestudent.org, an average annual tuition fee in the UK is around $13,050. Apartment rent and bills as well as food are also quite expensive. For instance, students’ household bills in the UK reach up to £73 a month in some areas! The national average bills expenses are lower - somewhere around £40. Socializing is another item of expenditure. UK students spend an average of £62 a month on drinking and going out. The transport expenses of the UK students can be up to £54 per month, while average food expenses are around £108 a month. In addition, UK students on average spend about £34 on clothes. All of the above makes £358 a month. Please note, this sum of money can vary depending on the region where students live. An interesting fact: students from UEA, Leeds Beckett, Loughborough, and Chester spend just about £200 a month on average. Now, let’s investigate the expenses of the American college students. There is no doubt that the biggest expense for the US students is the tuition fee. An average tuition ranges from $9,970 for public colleges to $34,740 for private colleges. Renting an on-campus accommodation would cost US students between $9,800 per academic year at public 4-year colleges to $11,100 per academic year at private 4-year colleges. Get prepared for other expenses, as American college students spend between $17,580-$50,900 on transportation, food, and entertainment per year! Moreover, studying at the public university is not cheaper at all than at the private one. The total annual cost at the University of Michigan, one of the biggest public colleges, can range up to $70,000! If a student chooses the meal plan that includes 3 meals (breakfast, lunch, and dinner), it can cost up to $8,000 per year. Besides, after graduation US students still have to pay out their student loans. For instance, according to the Federal Reserve Bank of New York’s quarterly report, on average a student’s debt for a bachelor’s degree is around $39,423. Here is a table with the average expenses of the US college students. Naturally, the amount of expenses depends on many factors, so taking "an average student" for an estimation criterion is not exactly correct. 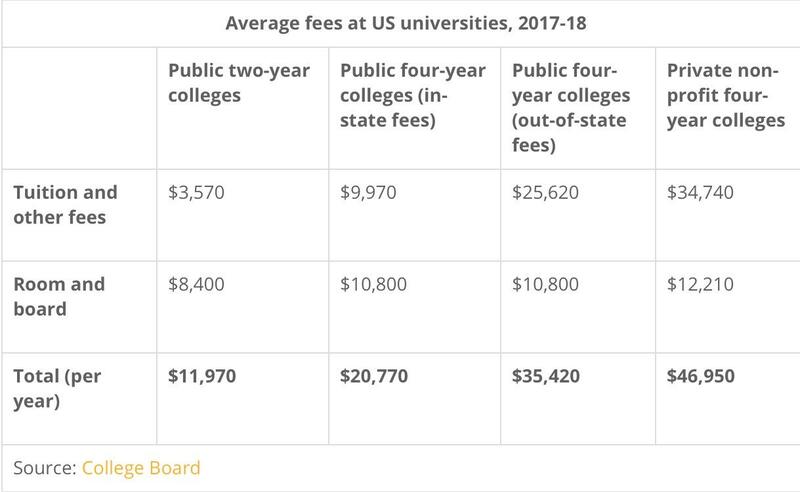 Still, it's possible to get a general idea of education price in both US and the UK. So, doing some basic calculations, we can conclude that US students have to spend a bit more compared to their British counterparts.